Hey there! I have a new LO to share today, courtesy of thinking*through*design. Today's thought is all about adding dimension to your pages. Sometimes when I'm working on a page, it seems flat to me, like it needs some oomph. When this happens, I look for ways to jazz it up, ways to give it dimension. Often, I've added pop dots under stickers and journal spots to give them some lift, Glossy Accents to stickers, to give them some shine. Today I tried something different. I had this piece of Fancy Pants paper that on it's own is bold and busy. I could have added a photo and been done with it. But it looked blah. I had a few ideas to fix it up, give it dimension. The first was to cut around some of the rays and raise them up with pop dots. The next was to sew around the remaining rays. The last was to cut out some of the stars so I could see the light blue cardstock I placed underneath. I added Stickles to both the above and below stars. 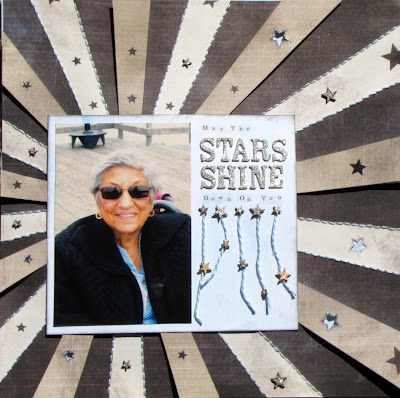 In other areas, I added Studio Calico wood veneer stars covered in glitter. Now the page had some lift, and as I looked around the page, my eye saw the rays move. The last few details to bring it all together were matting the photo on similar light blue paper, and using glitter Thickers for the title. I wasn't originally thinking of using this paper for this photo, but by making changes to the paper itself and adding all these elements, I made it work for a tribute to my Aunt. She passed away a few weeks after this photo was taken. Devra, this layout is gorgeous. It sure does have some "ooomph"! What a wonderful tribute. Love the layout and what you did with it! I never would have thought to cut the rays and pop them up, but it worked wonderfully! So pretty! Love your idea of cutting the rays and popping them up for added dimension! A very nice tribute to your aunt!